Travelling from sunrise to sunset gets you across about 2 hexes. 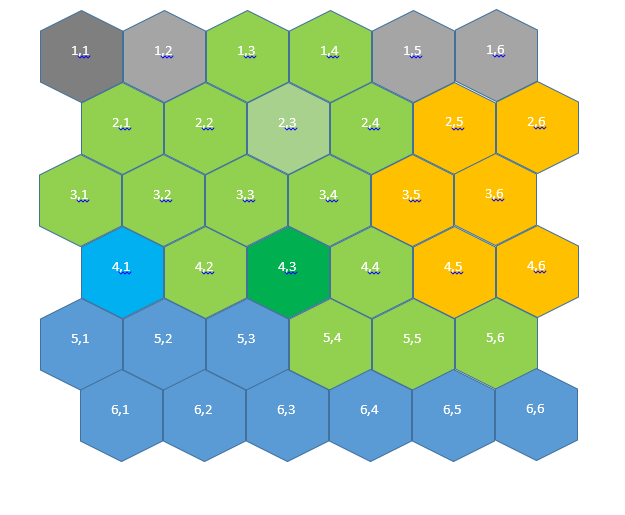 Expeditious travel, such as journeying by road, downriver, or with a fair wind at your sails, gets you across 3 hexes in the same amount of time. Roll once on a table for an encounter if needed, or twice to establish an interaction in progress that the players come across. More a fortress than a palace, this is the Church’s seat of power in the south. A foggy moor, lousy with steep drops and scree. 1: Northern witches, gathering heather. 2: Church guard, wary but dutifully patrolling. 4: Dim green fires that laugh like children. 5: Nettles, briars, thistles. This way looks like hard going. These rolling dales mark the edge of the northern mountain range. Tributaries flow south-west through Matsudaya Town (2,2), into Lake Bulana (3,2), all the way to Crag City (4,1). 1: Northern peasants, fleeing south. 2: Church guard, on patrol. 4: The flowers here… roll 1d4. 1: sing, 2: cause drowsiness, 3: cause sickness, 4: are nice. 5: 1d4-1 people with fishing nets on their way to the river. Rolling a 1-1 means you find a net. 6: A freshwater mermaid, on a traditional pilgrimage to the river’s source. Dense woodland, ancient trees. Famed as a hideout for ne’er-do-wells. 2: The hollow knocking of woodland spirits talking to the trees. 3: A branch breaking under an outlaw’s heavy step. 5: The calls and rustling of wild game, roll 1d4. 1: deer, 2: pig, 3: grouse, 4: pheasant. 6: A northern witch humming to herself as she gathers mushrooms. Tall, grey mountains that make the path northward treacherous. 1: The bogeyman. He can only eat lost things and will ask you very nicely whether or not you are. 2: Wild animal, roll 1d4. 1: bobcat, 2: sheep, 3: goat, 4: some birds. 3: A shepherd from the north, looking for his lost sheep. Doesn’t speak the local language. 4: A pterosaur rider, out on flight training from the gulch below (2,5). 6: A small stone falls from higher up. Roll again, ignoring results of 6, for what knocked it down. Tunnels in the tall, bare mountain. What some call a dungeon. major conflict between the two factions left this place cursed. 1: A skeleton. Impossible to tell which side they belonged to. 2: Old Church weaponry, the metal rusting over. 3: Old local weaponry, the wood and bone brittle with age. 4: They are called grave-worms, charnel-boys: little pale folk that scavenge such places. 5: Church officials travelling between the town (2,2) and the Palace (1,1), with guard. A cluster of traditional buildings on both banks of a river, interspersed with modern stone structures. The first place to accept the Church after the initial conflict. 1: The local branch of the Church. Temple meets sheriff’s office. 2: A local home. Simple yet comfortable, low wooden walls around a central hearth. 3: A small, old shrine of the local spiritual tradition. 4: One of many bridges and walkways crossing the wide river. 5: A local inn. Warm, full of cheer, a boar or pig on the spit and salted rice snacks to spare. 6: The main bridge. Ornamental and grand. Seasonal blooms are hung here during festivals. Flooded fields where local farmers grow rice the traditional way. A water wheel and old irrigation system diverts the water from the Greenspring Hills (1,3). 1: Fish that eat pests and regulate the water. It’s said one in a thousand is made of solid gold. 2: A rice farmer, inspecting or harvesting the crop. Often accompanied by a trained dog. 3: Church guard on patrol. They tax the farm’s production. 4: A farmer headed to the brewing house, where they make rice wine. 5: A vagrant, trying to steal a meal. Sometimes monkeys do the same. 6: A freshwater mermaid, lost and a little confused. The land here rises and falls every which way. The locals are used to hiking. 1: Church guard, on patrol. 2: Monkeys or birds calling in the trees. 5: Kids with butterfly nets. 6: An old, moss covered golem. Not particularly strong or fast, but looking for something to do. Deep canyons and gorges at the edge of the Mesa (2,6). It’s said that before the land dried up under the hot sun, a river flowed through here from Mt. X (1,5). 1: Climbers, digging carefully for fossil currency. Belemnites exchange for 1 coin, ammonites 5. 2: Pterosaur riders. The tribe that lives here form deep bonds with their flying mounts. 3: A pterosaur nest, with tribesfolk tending to the eggs. 4: A trickle of water from a spring, lush green plants clustered around. 5: Rogue, independent antlions, exiled from the colony (4,6). 6: Roll 1d4. 1: toad, 2: rhinoceros, 3: trilobite, 4: boar. Giant, headed to a mudhole to wallow. A plateau of barren rock. None venture here. 1: A shallow puddle of murky water by the shade of a dead tree. 3: A bleached skeleton, roll 1d4. 1: human, 2: tiny animal, 3: enormous beast, 4: utterly alien. 4: A tiny underground nest, lizards or foxes. 5: A crystalline growth protruding from the ground. Contagious. This land is claimed by huge and terrible beasts. 1: Matted hair as thick as armour. 2: Claws like sharpened tree trunks. 3: Teeth like the brutal steel swords of the north. 4: Bony plates or spiked protrusions, hard as stone. 5: Spit that burns like fire. 6: Too many… roll 1d4. 1: heads, 2: limbs, 3: eyes, 4: mouths. Said to be the place that the moon spirit came to meet his lover. A tranquil shore to the east, while terrible things roam the west bank (3,1). 1: A huge stone, hurled by something from the far shore. 2: River fish. Folk often come here with nets and spears. 3: A deep creature, its ensnaring tentacles disguised as weeds. 4: The glint of a dropped coin. Or a shell that looks like a coin, perhaps. Mermaids like those. 5: A river raft, taking barrels down to Crag City (4,1). The deacon here offers respite and runs services. Most come for the advice of the anchorite, a northern woman, self-sequestered to a life of study and pious devotion. 1: The bell in the church tower, or the whining of White Michael, the ghoul who lives up there. 2: The deacon leading a solemn reception in the graveyard. 3: Exultant singing from the church hall. Praise be! O, Holy Father! 4: The calm, quiet voice of the anchorite, offering consul to a local farmer. 5: Silence. Church officials are within, discussing private matters. 6: A thief taking roof tiles. Four roads converge, and a legendary alehouse marks the crossing-place, its namesake. Local rice brew, imported rum, hot meals and warm beds are all on offer. 1: Church guard, enjoying time off. 2: A local drunk, belligerent. 3: A family enjoying a meal on the road. 4: Friends from Santoc Caladine (5,4), gossiping and merry. 5: Farmhands taking a breather. A little trading post on the edge of the arid east. 1: Church guard, keeping a watchful eye. 2: Eastern traders, riding flightless birds and peddling colourful cloth and amber. 3: Farmers with bags of rice or carts laden with vegetables and cured meats. 4: Pterosaur riders from the canyon (2,5), trading fossils and fruits for supplies. 5: Local craftsmen. Tools, rope, all sorts, made of plants and wood and bone. 6: From the salt flats (4,5), roll 1d4. 1-3: honest salt traders, 4: bandits. A dusty, rocky plain dotted with trees and stubborn grasses. 1: Eastern traders. Wrapped in many-coloured cloths and riding flightless birds. 2: Lion Men. These noble folk are nomadic guardians of this place. 3: Overhead, pterosaur riders from the nearby canyons (2,5). 4: An antlion procession, gathering food and materials to take home (4,6). 5: Wildlife, roll 1d4. 1: birds, 2: rhinoceros, 3: wildcats, 4: snakes or lizards. 6: Nobody, just dry earth and scrub. An inlet, a huge sundering in the cliff face by the shoreline, made into a vertical shanty town. 1: The deepest stratum, where boats dock and goods trade hands by night. 2: The Gut. Food and drink, steam and smoke. Full of people, stalls, tables, lights, music, colour. 3: The Upper Gut. Stall-owners’ apartments and second-floor secret spots. Voices from below. 4: Mostly residential. Space here is scant, but pot plants and pet cats make it home. 5: More spaced out this far up. A quiet place, but where’s the fun in that? 6: A few shacks dotted around the city’s heights. Occasionally a monster (3,1) crosses overhead. One big hill, cresting out of the surrounding fields and woodland. 2: Flowers wave in the breeze. Hummingbirds sip hibiscus. All is at peace. 3: Patient locals in prayer. Nearby is a small shrine to the Ranting God. 4: Shifty folk making their way to Crag City (4,1). 5: A small gaggle of the faithful heading to the chapel (3,3). 6: A cloud of startled birds rise from the Dolmenwood (4,3). In the thick of the forest rest ancient standing stones. The spirit that guards this place is said to appear in the form of a mother snow monkey, carrying her babe astride a golden deer. 1: A criminal, on the run. 2: Animals. Deer, boar, maybe a monkey or two. 3: Butterflies by day, moths at night. They say moths know secrets. 4: A game hunter. Pelts and meat to trade. 6: The cacophonous peace of a forest. Birds, insects, branches. Spirits, if you have the Sight. The road to Santoc Caladine (5,4) skirts between the edge of the Dolmenwood (4,3) and an outcropping of rocky hills to the east. Small farmhouses dot the roadside. 2: An escaped pig from a nearby farm. 4: A farmer headed south with goods to sell. 5: A farmer headed north to the pub at the Crossroads (3,4). 6: Something bursts out from the trees! Roll on the table for (4,3), ignoring rolls of 6. Beyond the craggy rocks east of the south road (4,4), the air is dry. A lake was here once, long ago. 1: Sea creatures from an age gone by, frozen under layers of crust. 2: Salt farmers, skimming the surface and filling the wicker baskets on their backs. 3: Pink salt flowers. They can be infused into a petal tea that lets you see into the spirit world. 4: Bandits. They skate around on fossilised jawbones and steal your lunch. 5: Antlions marching back to their home (4,6). 6: Something wandered down from the savannah. Roll on the table for (3,6). A huge stone hive of networked tunnels, chambers, pockets, whorls and pits, standing proud in the desert like a giant’s tombstone. The antlion folk are insular to a fault, but not evil. 1: Guards. Who goes there? 2: A hunting procession, carrying back well over their weight in foraged food. 4: Nurses carry grubs, food for grubs, food for the queen, busy busy. 5: One curious young antlion. 6: This tunnel appears to be old and forgotten, at least for now. The area of choppy ocean by the cliffs near Crag City (4,1). 1: A mob of saltwater mermaids. The seabed here is part of their territory. 2: A small boat, headed in from Smuggler’s Island (5,3). 3: An optimistic old fisherman. 4: A large fin cutting through the water. Mermaids hunting, not far behind. 5: Pearl divers, naked elderly women. 6: A message in a bottle. Someone held captive by a gang in Crag City (4,1) needs help. The waters can get rough here, but it’s the quickest route along the coast between Crag City (4,1) and other destinations out to sea, such as Smuggler’s Island (5,3). 1: A little boat, saltwater mermaids circling. 2: Smugglers headed to the island (5,3). Roll on that table for their cargo. 5: Traders going along the coast. Roll 1d6, go to that column on row 6, that’s where they’re headed. 2: Spices from the far south. 3: A blue pigment not found in this part of the world. 4: Forged coins, traceable back to Crag City (4,1). 5: Wispy things, between vapour and gossamer strands. Alive in the way bacteria are. A lazy fishing village. A light tower on the cape, and sailboats moored beneath stilt houses. There’s a friendly plaza, where old men bring their caged songbirds and the womenfolk drink tea. 1: Fish. The little glittering ones from the bay, or shellfish if you’re lucky. 2: A kelp harvest, for soups and all manner of dishes. 3: News of a storm. 4: Rum and trade goods from Gyaran Island (6,3). 5: Nothing today. Better pray at the village shrine for a bounty tomorrow. 6: A more exotic catch. Roll on the table for (6,4), ignoring rolls of 6. In a forgotten age, a stone tower stood here. Now, the turret is sundered. None dare enter. 1: A vision of death. Run. 2: A famed outlaw. So this is where they’ve been hiding! 3: A vengeful ghost. Those with the Third Eye can see what they were in life, an old scholar. 4: A weeping ghost. In life, a handsome youth, newly apprenticed as a wizard. 5: A spellbook. It is animated and will cast the spell it contains to protect itself. 6: A giant centipede. These vermin infest the crannies, eating old parchment. A gargantuan stone spiral staircase. Whether this is how the wave giants came down, or some other giants left, nobody knows. What is at the top, if there even is one, is a greater mystery. 1: Bandits, hiding in crevices. 2: Little gardens of laddervine, planted by hopeful children. 3: A troupe of climbers. Few actually believe they can get very far, but they enjoy trying. 4: A madman, raving about having descended from the clouds. 5: A mourner, quietly pining for a lost love who ascended the staircase years ago. 6: Nobody. Quiet today. The heights beckon. Actually two tiny islands, tall chunks of rock split by a ravine. Nobody can agree on whether or not the name is ironic. 1: Outlaws, in hiding. They’re almost out of rations. 2: Saltwater mermaids, a hunting party. 3: Ships passing by at a distance, peacefully unaware. 4: Pelicans. A black one is an omen of death, though not dreaded. At night, glowing sky jellyfish. 5: Moths the size of albatrosses. They eat fire. By day, ordinary butterflies. 6: A curious wave giant, leaning on the island cliffs, silent and beautiful. This far out, there’s only blue on the horizon. 1: Saltwater mermaids, dragging a fresh kill. 2: A boat wafting nets through the air. Sky jellyfish are easier to catch at night, when they glow. 3: Crabs on an impromptu raft. They serve the Crab King, as all noble crustaceans do. 4: A passing ship from Gyaran Island (6,3) to the east. Fishing, presumably. 5: A storm, coming in from a random direction. Roll 1d6, where 1 is north and so on. 6: Nothing but ocean. The Third Eye can make out astral whales and the ghosts of dolphins. Once its own small kingdom, long ago the island became just another part of the coastal community. These days they do their best to evade the Church’s influence. 1: Fending off a boatload of Church guard. 2: The citrus orchards and sugar cane fields. 3: A celebration! A feast and dancing, around the great wooden idol to the Last King. 4: Their boats. Fishing, or trading with the mainland. 5: The town lodge, home of the law. A fair trial offered to all, and all serve as jury. 6: The shrine to the island spirit. Prayers offered, incense burned. Just beyond the bay of Santoc Caladine (5,4), the water is calm, and the wind often easy. 2: A school of brightly coloured fish. 3: An old relic of bracken-covered stone. A piece of a pillar, an odd orb, a giant stone hand. 4: An enormous crab. Could it be the fabled Crab King himself? 5: An everyday object, like a comb or hunting horn, but ten times as big and made of coral. 6: A wave giant to the south, watching quietly from a distance. Here the cliffs are tall, and the waters broken up by large, craggy rocks. 1: A small fishing boat, smashed to pieces. 2: A piece of old stonework, its shape unintentionally hilarious. 4: A huge shard of star-glass, once part of a wave giant’s mirror. 5: A single bone from a human skeleton. 6: Detritus, something caught within. Roll on the table for (6,4), ignoring results of 6. The scattered remnants of a long-dead civilisation litter the south coast. Here lies their grandest epitaph, hidden deep beneath the waves. 1: Stone structures, overgrown with sea life. Crumbled walls, strange circular totems, worn statues. 2: A curious saltwater mermaid, broken away from the pack to explore. 3: A treasure chest. 50% chance of either a small treasure or an angry chest-wearing octopus. 4: Eels. They eat your face off and then weep in your voice to lure their next victim. 5: A sealed glass jar, roll 1d4. 1: green fire, 2: a letter in the ancient tongue, 3: medicine, 4: poison. 6: An old sage of the sea, sleeping in a large bubble. Can teach the language of storms.